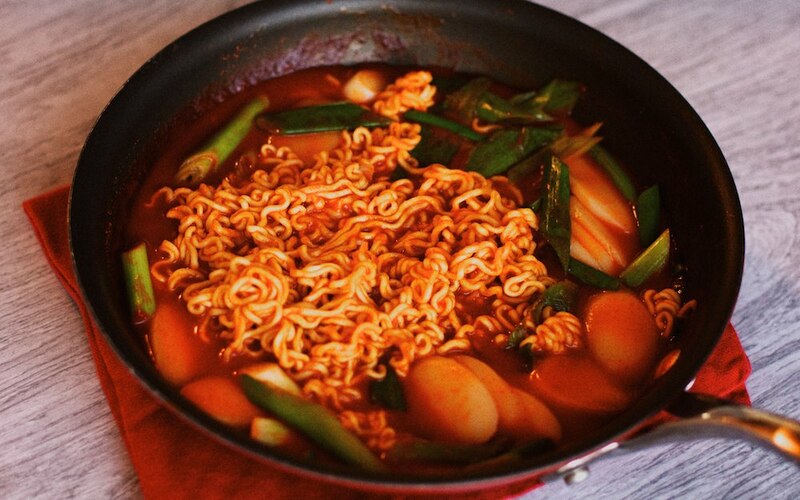 This is one of the simplest Korean dishes to make. Throw together a couple thawed rice cakes (떡), some water, sugar, red pepper paste (고추장), onions (파), ramen (라면), and soy sauce into a pan and 10 or 15 minutes later you’ve got a delicious batch of dokkbokki (떡뽁이) to chow down with a drink (or two… or three). So then, why is this worthy of writing about? Well, for one it marks the end of a nearly year long hiatus from anything that resembles cooking (I’ve eaten out for over a year) and two, this is the first time I’ve ever cooked Korean food by myself. I guess it could seem like a trivial event but for me it feels like some kind of milestone. I’ve long been the helper, but never the “cook”. Perhaps it’s one step further towards being a bit closer to Korea. This entry was written by Jungho, posted on 2011-08-16 at 06:31, filed under Return to Reality, San Francisco Déjà Vu and tagged food, korean food, milestones. Bookmark the permalink. Follow any comments here with the RSS feed for this post. Post a comment or leave a trackback: Trackback URL.